Grand prize includes $500 in Rhino Linings® gift cards and total garage transformation. 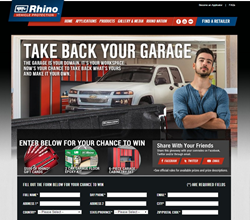 Rhino Linings Corporation (http://www.rhinolinings.com), a global leader in protective coatings best known for its sprayed-on truck bed liners, today launched a new 2016 Take Back Your Garage Sweepstakes for consumers looking to upgrade their vehicles and garages. Now through June 30, 2016, sweepstakes participants will be awarded a $25 discount coupon to use toward the purchase of a Rhino Linings® truck bed liner application and a chance to win the garage makeover grand prize. One 6-piece garage storage and cabinetry set. "Customers and fans deserve the most durable protective products in their truck beds and garage." said Elaine Luttrell, vice president of sales operations and marketing. "The Rhino Linings Take Back Your Garage Sweepstakes connects our fans with the best of both, a professionally applied Rhino Linings sprayed-on bed liner and a Rhino Linings epoxy garage floor coating." No purchase is required to enter. The sweepstakes is open only to U.S. and Canada residents (except residents of Quebec and Puerto Rico) who must be 18 years of age or older on the day of registration. All eligible entries will be entered in the drawing to win the Grand Prize. The sweepstakes ends June 30, 2016. To enter, visit http://www.rhinolinings.com/tough and follow the sweepstakes entry instructions on the website. All eligible participants will be entered into the Grand Prize drawing on July 1, 2016. Entries are limited to one per person. Other restrictions may apply. Additional details about the contest and the Official Rules are available online at http://www.rhinolinings.com/tough. Rhino Linings Corporation, established in 1988 and headquartered in San Diego, California, is a privately-held corporation and world leader in protective coatings and linings. Products manufactured and distributed by Rhino Linings Corporation include polyurethane, polyaspartic and epoxy coatings, concrete coatings, spray foam insulation and sealants, and interior and exterior stucco. Rhino Linings Corporation has a global retail and industrial applicator network consisting of more than 2,000 independently owned and operated businesses in almost 80 countries and is the first company in the sprayed-on bed liner industry to achieve ISO 9001 certification. For more information about Rhino Linings Corporation, call 858-450-0441 or visit http://www.rhinolinings.com.